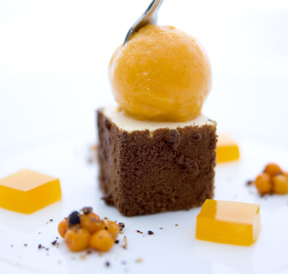 Chef Marcus Nemrin of Sofiero Palace Restaurant (Sofiero Slottsrestaurang) in Helsingborg, Sweden graciously shares his delicious recipe for Chocolate Coated Almond Mousse with Sea Buckthorn Sorbet. Method: Let the milk, cream, vanilla, almond oil, and the almonds boil for 2-3 minutes. Let the sugar caramelize in a saucepan, add the melted sugar to the boiling almond milk and let the mixture boil until the sugar has been dissolved. Whip the egg yolk for a few minutes, and then slowly add a small amount of the boiling milk while continuing to stir. Add the egg yolk mixture back to the remaining milk in the pot and whip over medium heat until the liquid reaches 85° C (185° F). Add the gelatin and immediately pour through a strainer into a bowl. Gently mix in the whipped cream, and pour into individual molds. Freeze for a few hours and then cover with the outside with melted chocolate. Method: Blend the ingredients in a mixer, strain, and freeze in an ice cream maker. Method: Blend the sea buckthorns and the syrup, and then add the lemon juice. Bring the mixture to a boil, and skim the surface of foam. Add the gelatin, pour into a pan, and let chill. Cut into shapes when firm. 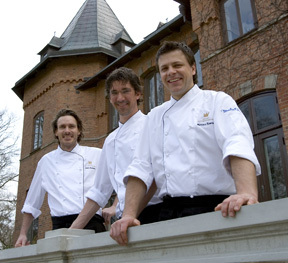 Read other articles on Sofiero Palace Restaurant (Sofiero Slottsrestaurang) in the Restaurants section and also Chefs' Recipes in Swedish. Read other articles on Skåne in the Destinations, Hotels and Resorts, Restaurants, Chefs' Recipes, Arts and Antiques, Spas, and Gastronomy sections. Read other articles on Sweden in the Destinations, Hotels and Resorts, Restaurants, Chefs Recipes, Gastronomy, and Travel News - Sweden a Green Destination sections.